Family-owned small businesses are a staple of the metal fabricating industry in North America. They have provided a stable and capable foundation for metal manufacturing over the years and will continue to do so for the foreseeable future. There just won’t be as many of them, however. Global competition and the Great Recession helped to clear out many companies. They simply couldn’t stay on top of the technology demands and business changes that were necessary to remain a link in key supply chains. This FaroArm 3D measurement device was part of a major capital equipment investment that Hi-Grade Welding & Manufacturing made in 2014. 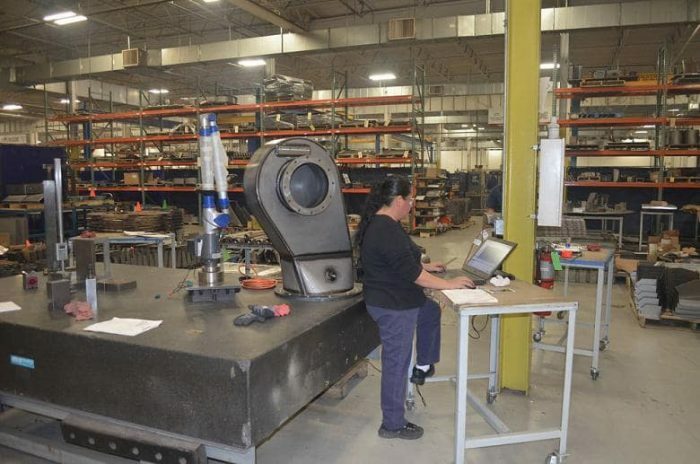 This flexible tool made it possible to conduct inspections of fabrications on the shop floor and not have to worry about dragging parts across the facility to an inspection room. In many instances, the management of these shops didn’t have the business acumen that matched their metal fabricating chops. They might have been busy, but had no real idea if the work was profitable. They might not have reacted quickly to downturns in business. They might have relied on older machinery while competitors made capital equipment investments in new fabricating technology. Bill Downey, president and CEO, Hi-Grade Welding & Manufacturing, Schaumburg, Ill., is familiar with such scenarios, as he’s become more involved with manufacturing industry groups in the Chicagoland area. He hears stories and sees cases of businesses that aren’t necessarily in financial trouble, but really don’t realize how close they may be if just one catastrophic event occurs, such as a major customer going out of business. Downey has been a part of that family business dynamic. He worked at Hi-Grade in the early 1980s as he studied to get his Bachelor of Science degree in electrical engineering technology from Bradley University. He ran a cold saw, cutting tubing all day, and swept up the shop floor in between jobs. In 1985 he graduated and began his career working in the power generation industry. He also formally married into the family that ran Hi-Grade. By 1990 the owners of Hi-Grade were interested in growing and automating the business and asked Downey if he’d be interested in joining the company. Sensing an opportunity where he could make a real impact, Downey said yes. Hi-Grade had evolved a bit since he worked there during summers, having made an investment in machining capability to add to its welding expertise. Because these were the days before PCs were ubiquitous, Downey had the company invest in a mainframe computer. He worked to automate the billing system and set forth on trying to formalize processes, such as quoting, going so far as to provide welders with a time sheet indicating how long it should take to complete a job. From there he immersed himself in all aspects of Hi-Grade’s activities. He learned G-code to program the CNC machining centers. He became familiar with the sales and developed some accounts. He learned how to read a blueprint and how to break down the assembly for a better understanding of quoting. “I got face time with every job out on the floor,” Downey said. In the mid-1990s Hi-Grade added key talent to the team as well. Jon Frejd, a moldmaker, was hired to manage the CNC manufacturing operations, and Howard Renner, who is a CPA, joined the team to manage the finances. Both remain a part of the company to this day. What looks like a pretty mundane scene from a fabricator’s shop floor actually tells the material movers at Hi-Grade quite a bit. The orange cone on the stack of tubes tells the material mover that the job is ready to be sent downstream to another station for further processing. If it were a yellow cone, the material mover would know that the tubes were ready for delivery to an outside processor. A green cone signifies that the job is ready for delivery to the customer. These are all examples of visual management that Hi-Grade practices to keep jobs moving so that daily production expectations are met. In the late 1990s, a phone call from another manufacturing company set Hi-Grade on a new path. 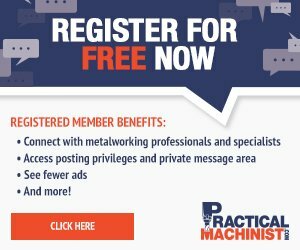 The local fabricating company asked Hi-Grade if it would be interested in punching some parts for a major computer manufacturer. The fab shop was in the process of getting progressive tooling made for those parts and was punching them on a turret punch press until the tooling was ready, but it was falling behind. Hi-Grade said yes, and two weeks later it was in the sheet metal fabricating business when its punching machine and press brake arrived. After a period of company growth that continued into the early 2000s, a period in which Hi-Grade purchased its first laser cutting machine, the job shop was destined for a large change. Downey had gotten a divorce, and the family had decided to sell the company to investors. In 2005 Hi-Grade was sold to Capital for Business in St. Louis and MidStates Capital in Overland Park, Kan. In 2007 Downey was named company president and CEO; Frejd, vice president of operations; and Renner, CFO. The business was no longer going to be reliant solely on family expertise and word-of-mouth to grow. Hi-Grade was about to go to the next level. Until the arrival of the private equity investors, Hi-Grade was pretty much like any other family-owned manufacturer, according to Downey. If the shop made money and parts were going out the door, everyone felt like the company was doing great. The marching orders were to continue what’s been successful and try to get more parts shipped the next month. “Well, private equity comes in and says, ‘That’s great, but what are your goals and objectives for this year, next year, and further down the road?’” Downey said. “They keep pushing you on metrics and forcing you to look at the way you do business internally within your organization, from your front office to external relationships to how you handle things on the shop floor. “They start driving you and making you recognize that there are better ways to do things to get more efficient,” he added. For Downey, one of the first major tests came in 2009 when the Great Recession began. The investors saw the company’s negative financial trend and asked the simple question of the company president, “What are you going to do?” Downey had to make the hard choice that some family-owned companies would have been reluctant to make. He let go 20 employees, some of whom had been with Hi-Grade for several years. “It was a very challenging moment, but it set us on the path that we are on today,” Downey said. The private equity owners were going to challenge Hi-Grade leadership even more. They invited a demand management consultant to come and give the Hi-Grade team some ideas on maximizing their manufacturing resources to be more responsive to customer demands. One of the first things the consultant did was create spaghetti diagrams to reveal how much wasted time was connected to poor plant layout. Downey said that the less-than-desirable plant layout had more to do with a small business simply growing fast as opposed to poor layout. Hi-Grade’s home at the time in Elk Grove Village was tight, and plant layout evolved as the company did. It started with welding, but when machining was added, milling machines were added to the floor. When turret punches were needed, they were placed in open areas. 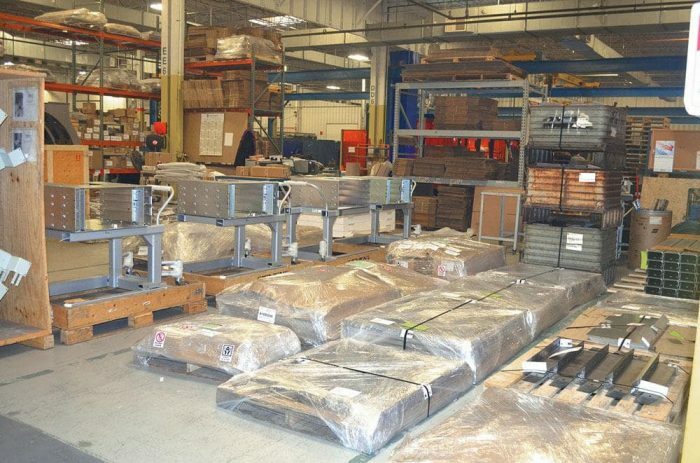 It had gotten so constricted in the facility that when sheet metal was delivered, everything came to a halt because material was stored smack dab in the middle of all the other shop floor processes. Two Amada press brakes, an HG 1303 and an HG 8025, were purchased in 2014 in an effort to introduce more productivity in the bending department. In 2014 Hi-Grade was renting a building across the street from its main manufacturing facility to accommodate new assembly work, and the spaghetti patterns of material work flow were still an entangled mess. Downey and his management team found an old Motorola facility in Schaumburg where the telecommunications giant once made heat shields for mobile phones. It was a wide-open space with high ceilings, perfect for a metal fabricating company. 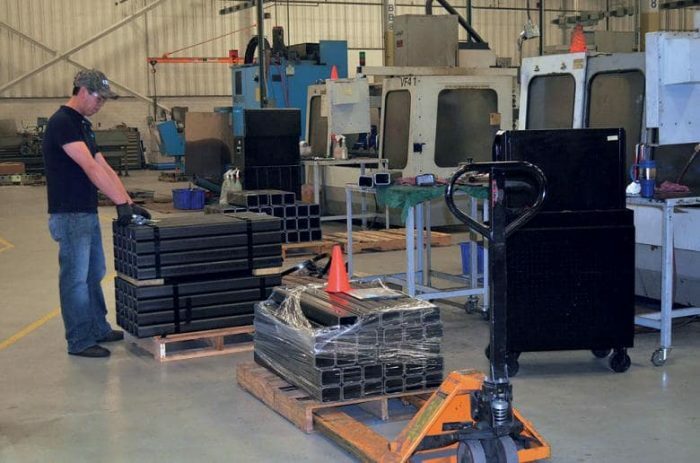 The move gave Hi-Grade the chance to lay out its plant in a more logical way—material delivery right to storage that feeds the laser cutting area, with bending, hardware insertion, welding, and shipping being located one next to the other. Any new spaghetti diagrams done in the new facility were going to have many fewer loops. Hi-Grade also took this time for a $1.5 million investment in capital equipment. 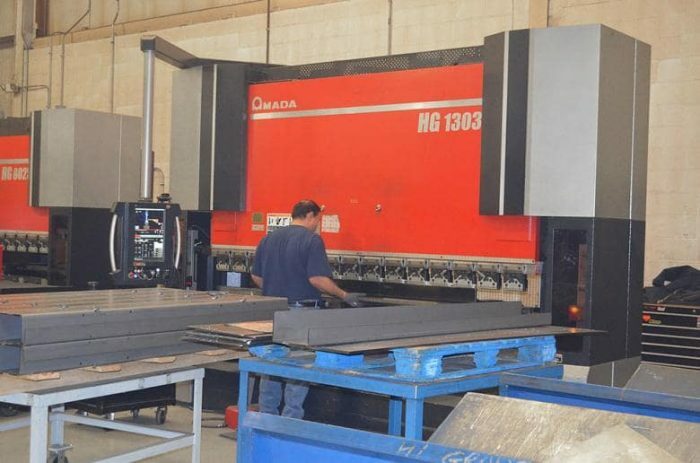 It upgraded its laser cutting capability with a new Amada CO2 laser cutting machine connected to an eight-shelf material storage tower for 24/7 operation. (“The fiber lasers were somewhat new at that time, and we needed something that was going to be up and running all the time,” Downey said.) It also purchased two new Amada press brakes, new inverter-based spot welding machines, and a FaroArm 3D measurement device for flexibility in quality inspections. The new facility was very much conducive to the type of company Hi-Grade had evolved into. It was no longer a job shop, taking any job of any particular volume. It was seeking out complex work that involved all aspects of its manufacturing operations: fabricating, machining, and welding. A good example of the type of work Hi-Grade specializes in is a part for a magnetic resonance imaging machine, Downey said. Hi-Grade is asked to hold bolt hole patterns that are 4 feet apart within ±0.015 in.—after welding. “We figured out a way to do it without postmachining. That saves our customer money and time,” he said. While 2014 to 2017 were relatively successful years for Hi-Grade, Downey said, business looked very promising for 2018. To keep up with the expanded opportunities, the company needed some help, and it wasn’t going to come in the way of more skilled labor, as it was struggling to find welders and CNC equipment operators. With the blessing of the owners, Hi-Grade was about to take another step forward in becoming a more modern manufacturer. One of the first things that needed to be addressed was offloading the hiring function to a professional. Like most small, family-owned companies, the people running the operation also did most of the hiring. That was OK when the company had only about 50 people, but by 2018 Hi-Grade was almost double that head count. To keep operations running smoothly, management couldn’t be missing out on too many key hires. 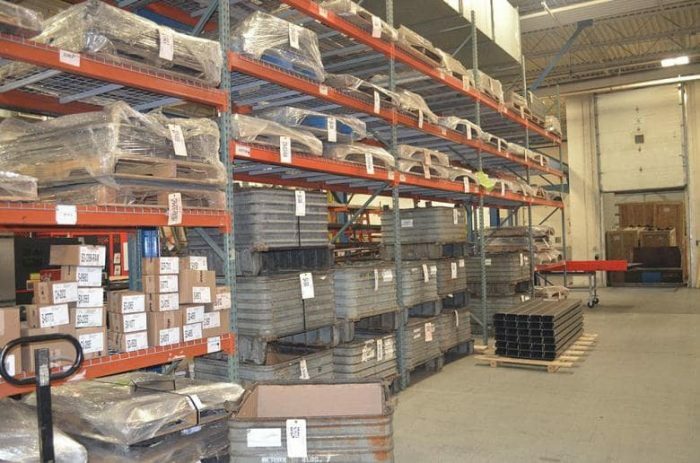 Managing inventory for customers is not something that accountants like, but it’s definitely one way that Hi-Grade can maintain 98 percent on-time delivery to its customers, even when a bottleneck exists in the welding department. “With the approval of the owners, we were able to go out and hire that person who is now helping us to fill the positions that we need,” Downey said. He added that Hi-Grade is now running three full shifts in the fabrication area, but still could add some CNC machining and welding talent. One of the reasons it was able to add that third shift to the fab operation is that Hi-Grade made a key capital equipment investment in 2018. 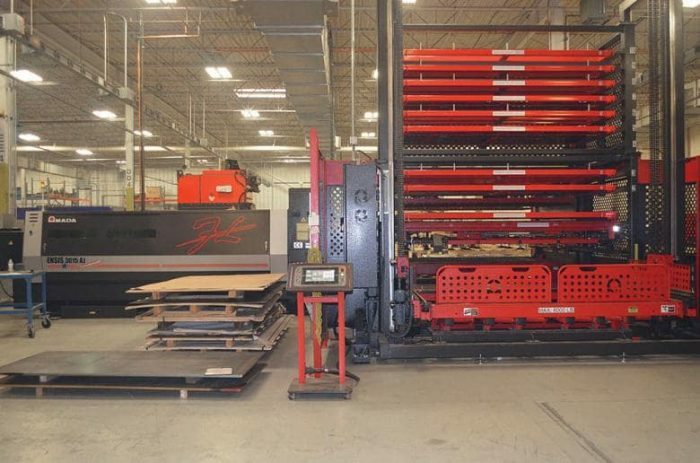 It added an Amada 3.0-kW fiber laser cutting machine with a 10-shelf storage tower. The only real operator involvement with the machine is helping to separate parts from skeletons after the machine is done cutting. The laser cutting equipment also can operate unattended, allowing labor to be focused elsewhere when needed. Downey said that the equipment’s cutting speed completely outclasses its CO2 laser in thin sheet metal. The CO2 might cut 16-gauge sheet at 180 inches/minute, but the fiber laser cuts it at 880 IPM. At about 3/8-in. thickness, both lasers are somewhat similar in cutting speeds, according to Downey. 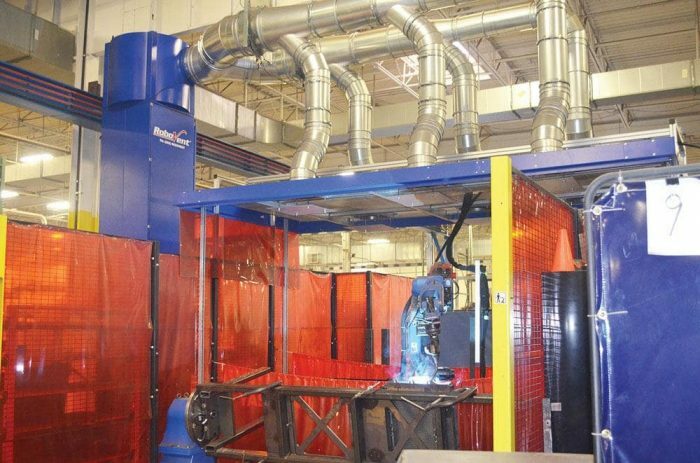 Around this same time, Hi-Grade added its first robotic welding cell—a Yaskawa Motoman robot with a Fronius welding power source and RoboVent welding ventilation system. The robot works in conjunction with a head/tail positioner that can rotate quickly from one job to the next, each job occupying one side of the positioner table. Downey said the welding robot has played a large role in landing new projects, some of which wouldn’t be profitable if a robot wasn’t involved. The cell is set up so that another robot could be added on the other cell, creating a mirror image of the welding robot that’s currently there. “We’re now involved with designing our own fixtures, which is a major challenge. So we’re having to wear that other hat now,” he said. In January Hi-Grade planned to add a second shift to run the robotic welding cell. Plans also call for possibly adding another robotic cell in the near future. For a company that started out as a welding house, Hi-Grade has a hyperfocus on its welding activities again. Sure, a bottleneck needs to be addressed, but welding still remains one of the differentiators for the company in the manufacturing-heavy Midwest. Its welders have the skills to prevent prestressing of materials and the knowledge to apply postheat to keep things within specified tolerances, for instance. By 2018 Hi-Grade was ready to invest in another laser cutting machine, and it was sold on the viability of fiber laser technology. This Amada 3.0-kW Ensis 3015 AJ delivers laser cutting speeds on thin sheet metal that Hi-Grade’s older CO2 can’t match. A certified welding inspector is now a part of the team. He can do things as exotic as die-penetrant testing or visual weld inspections to AWS D1.1. He’s also working to get the company’s welders certified for different processes. As the company enters its 50th year in business, if it wants to grow beyond its $17.5 million in annual sales revenue and its 115 employees, Downey realizes he needs to capture that expertise and share it with Hi-Grade’s new generation of workers. A structure is in place at Hi-Grade to ensure that happens. It’s all part of the plan, which is measured and re-evaluated along the way. This Yaskawa Motoman robotic welding cell is the company’s first foray into automated welding. Hi-Grade management sees it as a way to alleviate some of its welding bottleneck and take on jobs for which manual welding would be cost-prohibitive. Parts are ready to be shipped out. They are clearly visible in designated lanes so that the shipping department knows what needs to be shipped first.